Trusted broad-spectrum control. 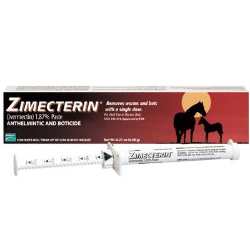 With a single dose, ZIMECTERIN controls a wide variety of important internal parasites, including bots and benzimidazole-resistant small strongyles. ZIMECTERIN is safe for adult horses and foals as young as 6 weeks of age, and may be used in mares at any stage of pregnancy. Stallions may be treated without adversely affecting their fertility Merial backs every syringe of ZIMECTERIN and ZIMECTERIN Gold with a 100% Product Satisfaction Guarantee. Foals can be treated initially with ZIMECTERIN (ivermectin) at 6 to 8 weeks of age. Repeat routine treatment as appropriate. Each syringe contains sufficient paste to treat one 1,250-pound horse at the recommended dose rate of 91-mcg ivermectin per pound (200 mcg/kg) body weight. Each weight marking on the syringe plunger delivers enough paste to treat 250 pounds of body weight.